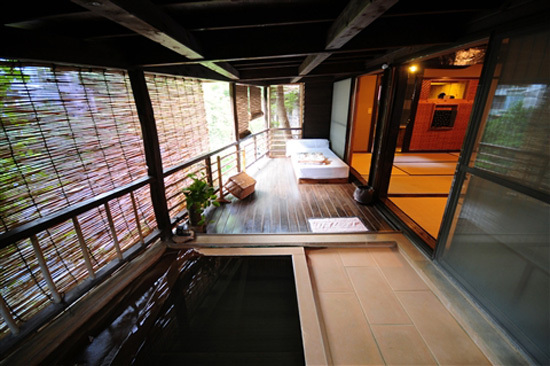 In our day, private onsen has evolved into onsen ryokans in Japan offering guestrooms with open air onsen; what was once a trend has started to become a standard in the industry. 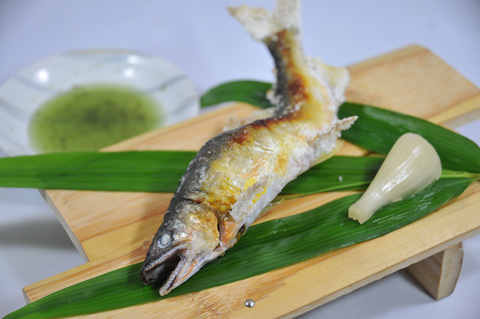 It feels as if it has become an essential item especially in the recent luxury ryokan. 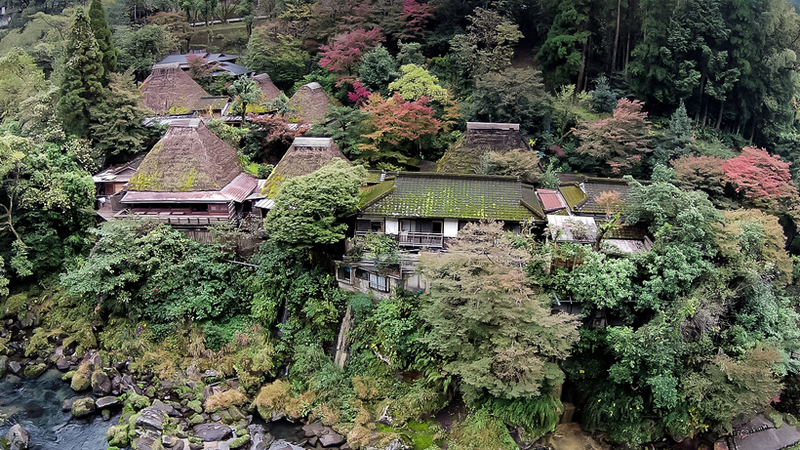 But the first hotel to actually “invent” the idea of guestrooms with a private open air onsen was this ryokan. 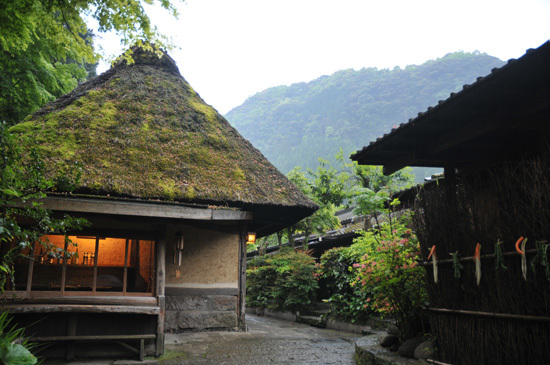 The guestrooms are actual old Japanese-style cottages with a thatched roof that has been dismantled and reconstructed. The bathtub made from hollowing out a large rock. 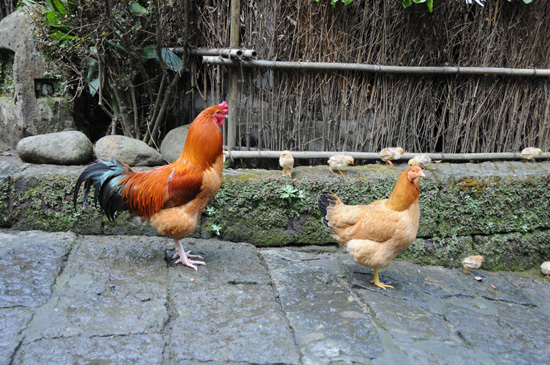 The pastured chicken parading within the grounds of the ryokan. 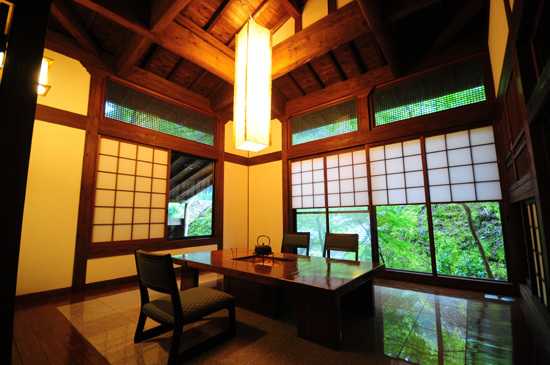 It could be said that this hotel has greatly influenced today’s ryokan industry and Japan’s hot spring resort areas. 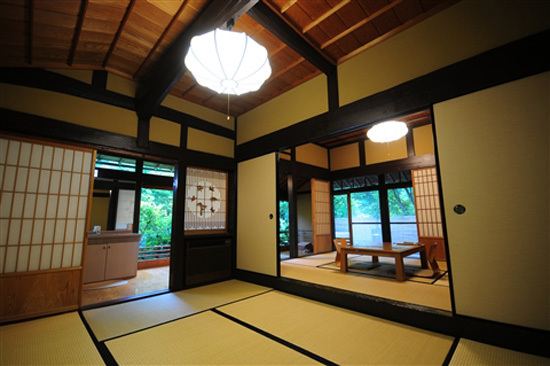 In other words, their approach to the business is that of using their ryokan as a stage to transmit the culture and customs of the area (Kagoshima / Satsuma) to the modern men. They have recently come up with unique and unprecedented types of rooms, such as their “living room with a bath” that incorporates an onsen bath right in the middle of a living room. 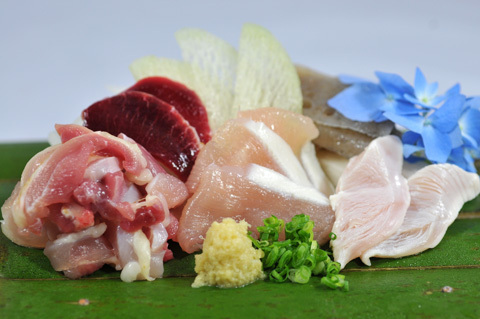 The owner, Mr. Tateo Tajima, enjoys a continuous pursuit of originality, always thinking outside the box of what is considered common sense in the ryokan industry, and this has made of “Wasure-no-sato GAJOEN” a place of reference that people in the same profession visit day after day. 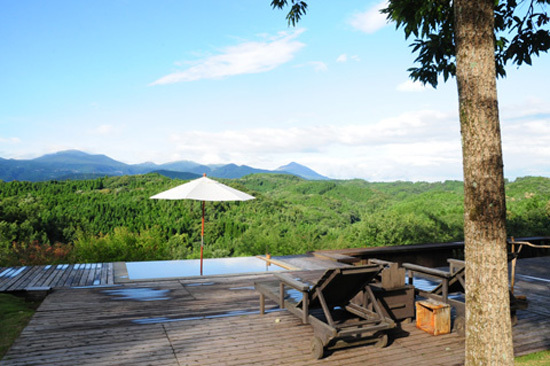 Furthermore, “Tenkuh no Mori,” their ultimate onsen resort, which enjoys a luxurious layout of two lodging facilities and 3 day-trip facilities in an area of 60 ha (13 times the Tokyo DOME) is gathering a lot of attention at the moment. Forget about time, and get away from the daily hassle. 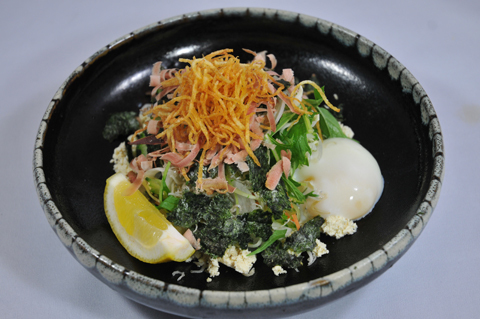 Surrender yourself and let go as you have a bath in the onsen and indulge in Satsuma cuisine. 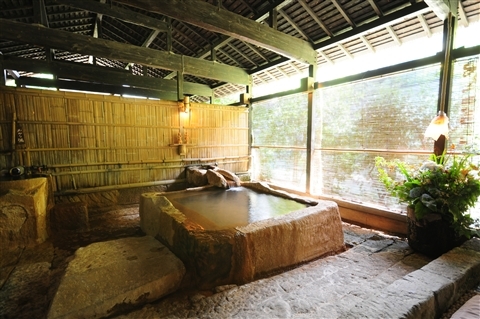 This bath is said to be the origin of guestrooms with an included open-air onsen. Created in 1978. 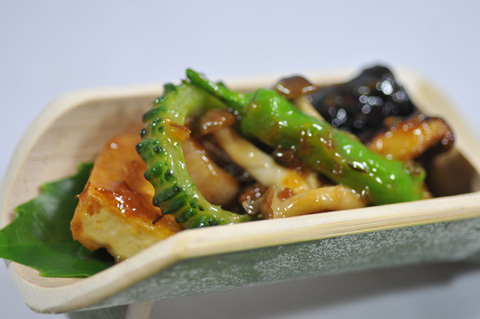 Afterwards, it has been visited by a large number of people related to the industry, and featured in several types of media, including television. 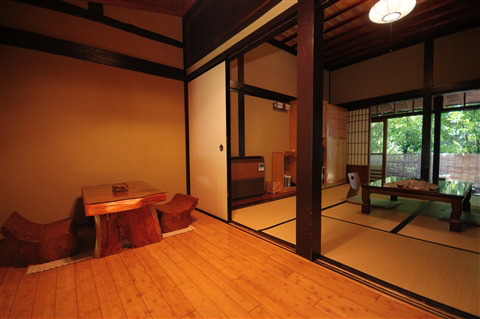 This room could be said to be the decisive factor that put “Wasure-no-sato GAJOEN” in the spotlight. At the back of the bath, which is located right next to the Amorigawa river and into which hot spring water flows directly from the source, there is an open-air shower booth. The day beds wrapped in towel fabric are also a nice touch. The large common baths of “Takeruyu” are separate for men and women, and consist in an spectacular bathtub hollowed out of a giant single rock weighing 20 tons, a process that took half a year. Of course, the water used is 100% hot spring water flowing directly from its source. The changing space is integrated into the bathing space, resulting in a great atmosphere. The skin-beautifying effects of this alkaline spring waters containing earth (sodium, calcium, magnesium – hydrogen carbonate spring) and the feeling of refreshment that you will enjoy after your bath will certainly make for amazing memories of your trip. And if this was not enough, the bath is available for private use between 9:00 pm and 6:00 am of the following morning. Private use operates on a first come, first served basis. Turn around the wooden board that reads “Currently Under Private Use” hanging on the entrance, and use the lock to close the door from inside. Instead of the guestroom having an open-air bath attached to it, this new concept is more about installing the bathtub itself right in the middle of the room. What would otherwise be an open air space becomes then a “room” equipped with air conditioning and sofas. The air conditioning allows guests to enjoy a comfortable bath not only during the cold of the winter, but also in the summer, when it can get too hot outside. 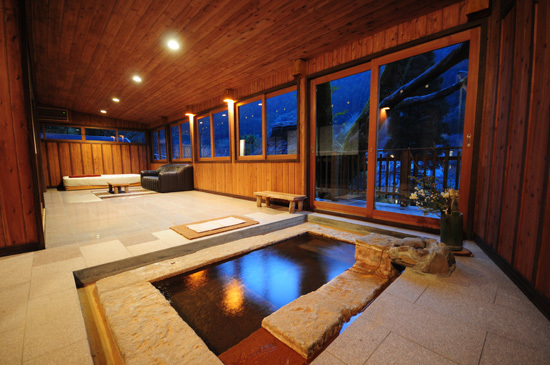 Worthy of note is also the fact that the floor of this room is heated by onsen pipes running right underneath it. 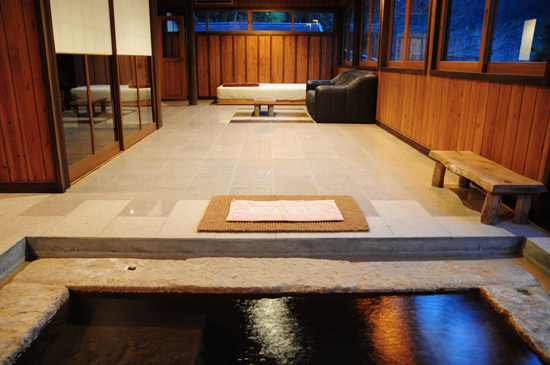 This nostalgic private baths by the side of the Amorigawa river evoke images of ancient watering places. There are two bathtubs and a waterfall shower (Utaseyu.) The tub at the back, known as “Ramuneyu” (about 36 degrees Celsius) is characterized by its “simple carbon dioxide springs” (estimation / no analysis chart). A little after you get in the tub, you can feel how the carbonic acid foam begins to attach to your body hair. 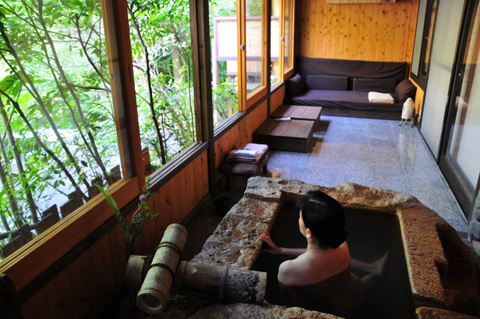 The other tub is filled with “mixed alkaline spring waters containing earth” (sodium, calcium, magnesium – hydrogen carbonate spring,) just like the “Takeruyu” bath and the open-air onsen included in the guestrooms. 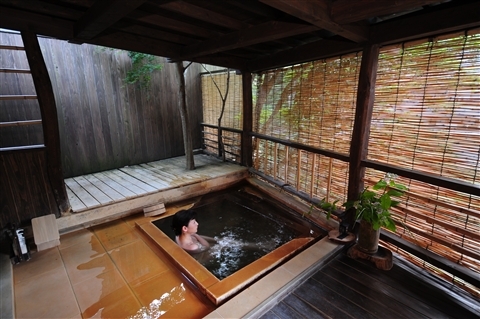 In other words, guests can enjoy two different types of hot spring waters in this private bath. By the way, the “Utaseyu” waterfall shower right next to the “Ramuneyu” tub uses alkaline spring waters containing earth at a low temperature of 37 degrees Celsius. From Hayato (JR): About 20 minutes by taxi.